As inclement weather descends upon construction projects across the country, now is a good time to remember the incredible value of prefabricated, insulated exterior wall systems by Sto. Because panel manufacturing is done off-site and indoors, there are fewer weather delays. Because the time to install a panel system is far less than a conventional building envelope, it enables builders to better weather the winter months and make the most of their construction calendar. 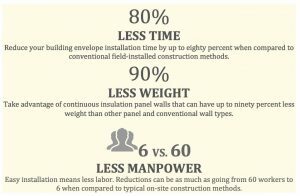 Regardless of the weather, prefabricated wall systems can compress a construction schedule, and make for a faster build time. In addition to saving time, lightweight, continuous insulation StoPanels can also save money. There are countless testimonials and examples of how StoPanels have saved on construction costs and greatly reduced the time of building envelope installation.